In addition to the general issues addressed in the portal in relation to household electricity, in this article we propose some ideas that may be useful in this field. Unless you need the outlet in a very particular place, adding an outdoor outlet is easy. Normally on the walls that face the exterior of a house there are several outlets directed towards the interior. From them you can drill the wall, mount an outdoor electrical box on the external surface and connect there a new outlet. This possibility is not allowed by electrical codes in all areas. Even if you install the plug with a waterproof cap, and in a dry place, the electrical codes of many areas establish that it must be at least 40 cm from the ground and a GFCI outlet must be used. 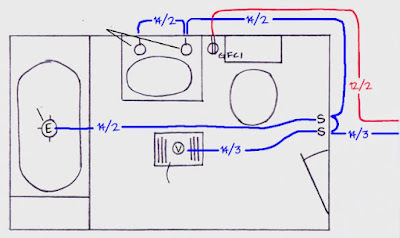 When installing the new outlet you must ensure that it does not overload the circuit, for example, if the intention of the outlet is to power a 1,500-watt electric heater for a micro-greenhouse, it is almost certain that the circuit becomes overloaded when the heater and connect another device inside the house to the internal socket. In these cases what you have to do is run a new circuit to the outlet. Remove the indoor electrical outlet and separate the wires to work on the electrical box, of course you have to disconnect the circuit's electricity in the circuit breaker panel. Remove the removable tab from the center of the bottom of the box. If the box is metallic and has no removable tabs you can change it for another one that has them, if it is plastic you can drill the hole with a sword bit. Remember that the sword bit can not make contact with the masonry, it would lose the edge at the moment, that's why it is better to work with the box outside. With a long drill bit, suitable for the material of the wall (it should be a masonry drill for walls of that type) drill a locating hole starting from the bottom of the inner box, which crosses the entire wall, and that is of suitable diameter to pass a 1/2 inch (12 mm) metal conduit. A 19 mm drill bit is enough. Preferably the hole must be horizontal so that then the holes of both boxes coincide and a piece of conduit can be placed to protect the wires. If the wall is hollow the situation is easier. Using the drilled hole as a reference cut the external wall to accommodate the electrical box. If the external wall is made of masonry, it is best to install a metal box of exterior and waterproof superimposed on the surface of the wall. Measure and cut the segment of conduit of appropriate length to join the two boxes, note that you must use a threaded adapter on each end of the conduit to secure it to the boxes and that it enters the adapter about 2.5 cm. Secure the duct at the bottom of the inner box introducing it from the outside and then do the same with the external one. Anchor the outer box to the wall. Use a level to make it horizontal. Run the connection wires of both receptacles, connect them, put the cover to waterproof and test the installation. Increase the capacity of a plug. When houses are built, it is reasonable for electrical outlets to be assembled in accordance with electrical codes but with the least expense, no builder will put 20 amp outlets with # 12 wire unless required or required by regulations. But then when you live in the house the thing can change. For example, your house has a 15 amp outdoor outlet, but it is "short" to connect all the Christmas lights you want, or the power tools you need, since you have built a small workshop in the place where the electrical outlet. The easiest and cheapest way to add amperage to your outlet is most likely by electrically separating the two plugs from the outlet and connecting each to a different circuit in the house. Let's see. The first thing you should do is look for an outlet that is connected to another circuit, that is very easy to know if there is an updated index of all the circuits in the circuit breaker panel cover, if not, then with a voltage tester go disconnecting one by one the circuit breakers until finding which of them feeds a circuit different from the plug in question. With a little luck, one of the outlets on the other circuit is on a wall of the exterior of the house. If it is close and there are no significant obstructions between the two receptacles (doors, large windows, intermediate walls, etc. ), it will be the additional power supplier. 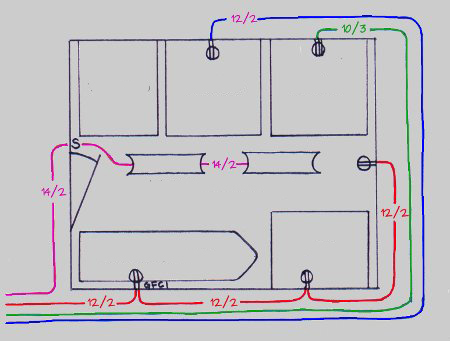 Use the method of the previous idea to pull the cable from the outlet to the outside, bring new wires from one box to the other by using ducts, buried or attached to the wall and put each plug to a different circuit (this article explains how the plugs are separated). This will double the capacity. 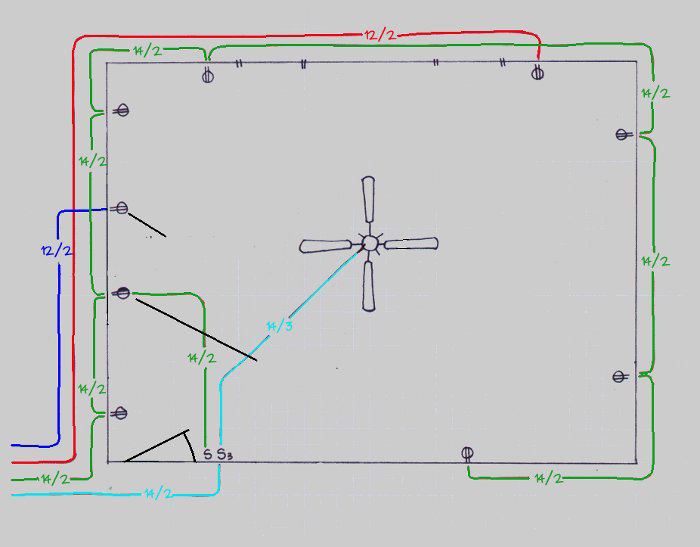 Below are some ideas that can serve as a guide when planning the electrical installation of the rooms. Some details of the lighting are given here. The bathrooms are usually small rooms with few lamps and electrical devices, but since they are humid places, the electrical codes have certain specifications for them. You will need at least two circuits, one for the lights and one for the outlets. Since hair dryers are often used in bathrooms and this is done near a water source, electrical codes usually require the use of a 20 amp circuit and a GFCI plug. The plug must be at least 30 cm from, or the, sinks. When the sinks are double you can put the outlet between them, or one on each side. In some places the circuit of the bathroom outlet is allowed to be shared with others in the house. When the bathroom does not have windows, in general the installation of an exhaust fan is required, which may or may not have built-in lights. If the extractor is only ventilated and does not have a heater, it is generally allowed to share a circuit with other bathroom lights. If in your case it is also a heater, then you will have to use a circuit of 20 amps dedicated to it and another one for lights with 12/3 cables. All lights used in bathrooms should be appropriate for wet locations. Always put the switches near the entrance door. The kitchen is the room with more electrical equipment in the house, so it is common to use 6 or more different circuits in it. Outlets: Place the plugs for small appliances on the counters, no more than 1.3 m distance between them and about 5 cm above the surface of the counter (in your area GFCI type may be required). Have at least 2 circuits for them. If your kitchen has an island, place electrical outlets on the sides of it. For powerful microwave ovens it is better to have a dedicated circuit of 20 amps. 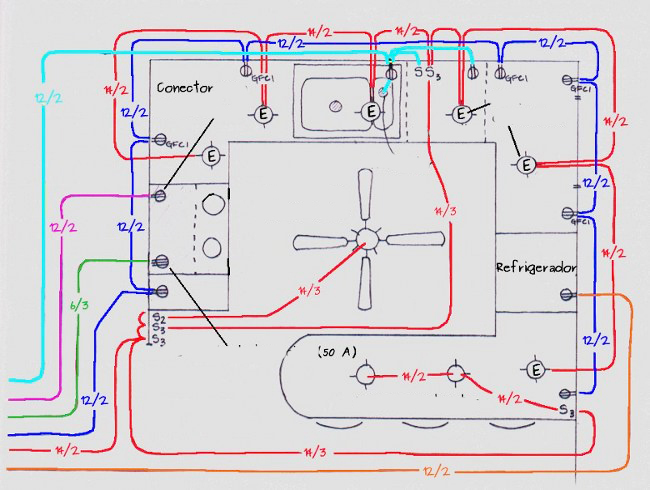 The refrigerator's outlet should be a dedicated circuit and better if it is 20 amps, although it can be used for 15. Put a switch on the counter to control the sink shredder. Appliances: The dishwashers are connected directly to the wires without an intermediate receptacle, run wires to it. If you will use an air extractor on the kitchen, this also connects directly to the cable. The plug for the electric stove will be 120/240 volts and high power placed close to the floor and behind it. A gas cooker only requires a 120-volt outlet. 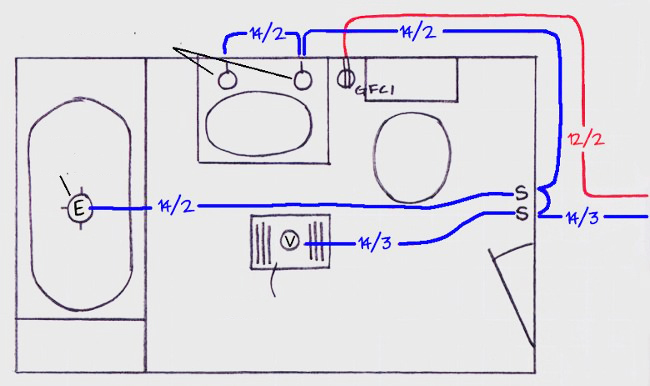 Lights: A kitchen with several lights may need more than one circuit of 15 A, calculate the load so as not to pass the circuits of the safe limit. The position of the switches should be the most convenient, and a large kitchen may need three-way switches to handle the lights from different places. The use of fluorescent lamps in the ceiling can be convenient as an ambient lighting element. The electrical codes of some areas demand it this way. Most rooms should have two lights, one on the ceiling and one on the wall connected to a socket controlled by a switch plus a pair of wall outlets on each wall, but you can go beyond basic needs and supply the room with special outlets for the purpose of a micro office or, to your liking, add more possibilities of connection or lighting in order to feel more comfortable. Outlets: The electrical codes establish that the outlets should not be more than 3.6 m from each other on a wall, but you can place them at a shorter distance if you prefer. To look at a television comfortably from the bed, it must be on a high stand, so placing the socket for it about 2 m or more from the floor may be convenient. It has been considered a window air conditioner, these are not of great power and a dedicated circuit of 20 amps 120 v may be sufficient. If the air conditioner is powerful and recessed in the wall, a line of 240 v 20 A may be necessary with a special construction receptacle for that situation, which is mounted in a standard electrical box, and with # 12 wire. An outlet with dedicated circuit to connect the computer is ideal, so the possibility of losing power when disconnecting a circuit breaker is significantly reduced. You should avoid placing plugs under the windows, where they can get wet with storms if the window is open. 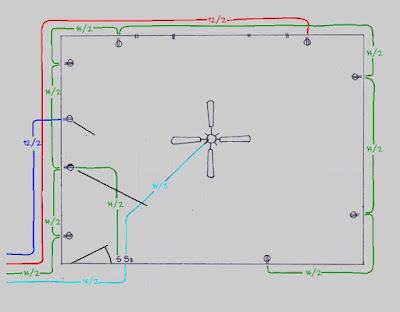 Lights: A cable 14/3 must be routed to the electrical box of the ceiling, so that the lamp and the fan can be controlled independently with two switches on the wall. Consider installing 3-way switches for the light / ceiling fan, one at the entrance to the room and another near the bed, can be very convenient. The laundry room is a room where a lot of power can be spent. 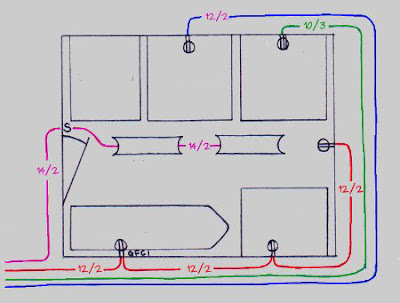 For the washer and dryer, when the latter is gas, a dedicated circuit of 20 amps is used, but if the dryer is electric, a 120/240 v receptacle fed with # 10 wires should be provided, ie, using a 10/3. The plug for the iron should also be 20 A and can be shared with other outlets in the laundry room. The lights do not need a separate circuit and can be powered by other lighting circuits in the house, but not by the circuits of outlets from any side, so you do not run out of lighting if a circuit breaker "falls" by overloading the electrical outlets. Taking into account that the washing area is an area that can get wet, a GFCI has been used to feed the iron.